How do germs cause disease, why do they affect some people and not others, what is immunity, and how do vaccines work? A germ is an infectious microorganism capable of causing disease (such as a bacteria or virus). For a germ to cause disease (for someone to actually get sick from an infection), the germ needs to be potent enough to overcome the defenses of that person, and then it needs to be capable of causing harm. 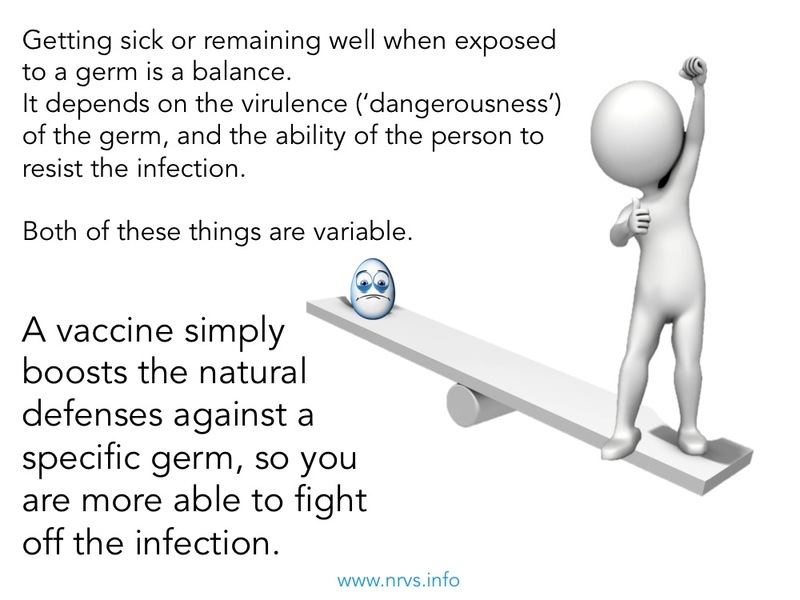 Virulence is the term used to describe how potent and dangerous a germ is, how likely it is to be able to overcome a healthy person’s natural defenses, and then how likely it is to cause damage or sickness. Some germs are extremely virulent, and able to break through even the strongest defenses. Other germs are opportunistic, and only cause disease if the host defenses are somehow damaged or deficient; for example if they are immunosuppressed with disease or medication, or frail with old age. Other things that can make some people or populations more vulnerable to infection than others include genetic and environmental factors (including things like socio-economic status, living conditions, overcrowding, hygiene and sanitation). 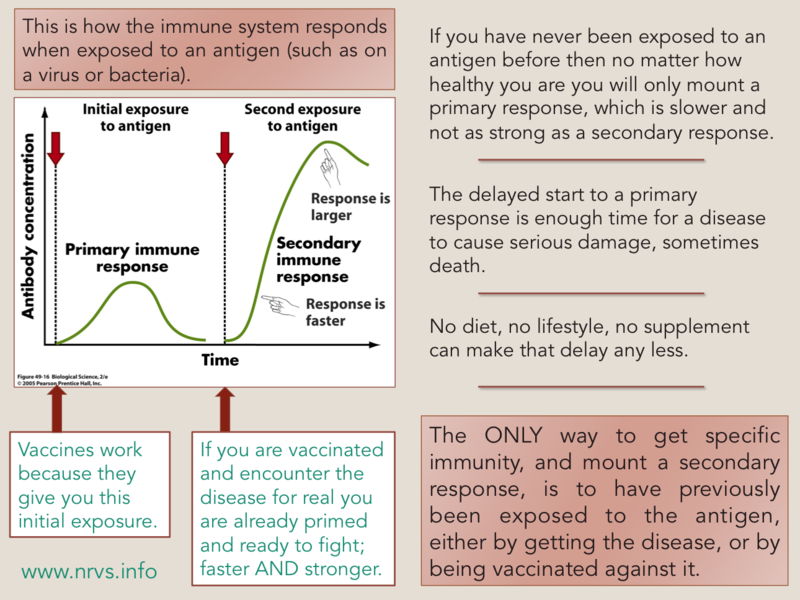 How does the immune system respond to a threat? To understand how vaccines can affect this balance between virulence and vulnerability, it is important to understand a little of how the immune system works. In immunology, any protein or molecular structure on the outside of a substance capable of triggering an immune response is called an antigen. Bacteria and viruses and other germs capable of causing disease display all sorts of different antigens on their surfaces, as do things like food and pollen. As the immune system develops and matures it learns to recognise whether an antigen is ‘foreign’ and potentially dangerous to the body, or something harmless and ‘belonging’. Allergies and auto-immune diseases occur when it gets this wrong, and the immune system thinks something that’s actually harmless (or part of yourself) is a dangerous invader and overreacts to try and get rid of it. The immune system is not a single entity, but rather an immensely complex collection of cells, proteins, and chemical mediators that is specifically designed to get rid of ‘foreign’ matter. The nature of the antigen (eg viral, bacterial, parasite or a toxin, pollen or a peanut), and how that antigen enters your body (eg via your mouth and nose, your gut, or your skin) will affect how your immune system reacts to it. But some elements of the immune response are consistent, and understanding those help explain how vaccines can help protect from disease. There are two main branches of the immune system; the innate (or natural) immune system, and the adaptive immune system. The innate immune system consists of physical barriers like skin and nasal hair and stomach acid, and cells that are capable of destroying other cells. It is a relatively basic system, and is not specific to any particular threat. Keeping fit and healthy and having a good diet can keep this part of the immune system stay in the best possible shape to be able to help fight off disease, but it is relatively basic, and cannot be ‘trained’ to recognise specific threats. The adaptive immune system is far more clever and sophisticated. It includes many different kinds of cells and chemical mediators, including T cells that help co-ordinate the response, and B cells that produce antibodies (a very specialised kind of protein that develop in response to specific antigens), and some that have the ability to remember antigens previously encountered. The innate immune system may be able to prevent a germ from entering the body, but if that proves inadequate (which often occurs if the initial protection forces are breached; for example through a trivial cut to the skin, or because the germ is very virulent and able to overcome any barrier) and an invasion by a germ has happened, both the innate and the adaptive immune systems are relatively slow and cumbersome to respond. It is the memory that develops after the immune system recognises an antigen for the first time that can lead to ‘immunity’. A second exposure leads to a quicker and stronger response that the first time, and so the cells that retains the memory mean that the immune system is primed and boosted and ready to respond if exposed to that antigen a second time. 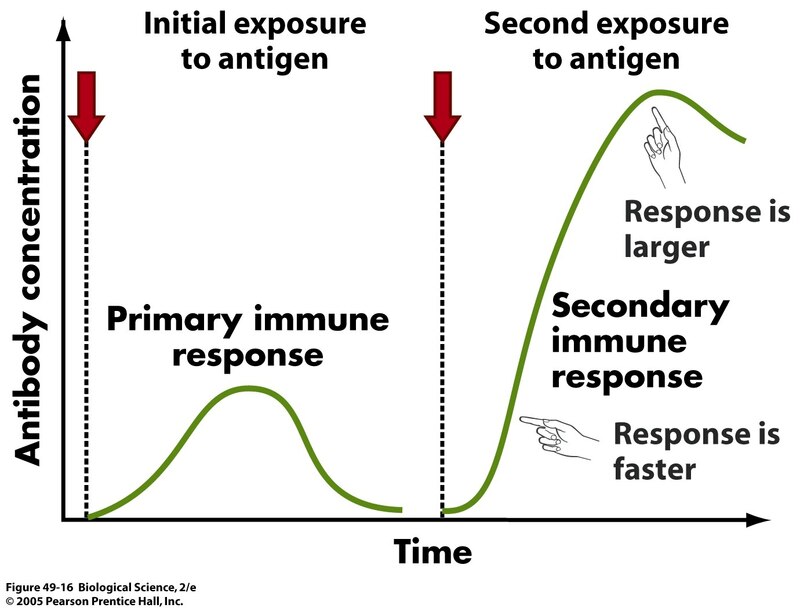 We see this in the primary and secondary responses to antigen as demonstrated in the graph below; the amount of antibody in the blood is greater and rises more quickly after a second exposure to an antigen. Both the innate and adaptive immune systems are triggered to respond to the immediate threat (to neutralise and eradicate the antigen). This is relatively slow, and disease and damage can occur before it has time to work. The adaptive immune system is left with a memory of what the antigen looks like, so that it is able to respond stronger, faster, and more efficiently if faced with the same foreign matter in the future, thus eradicating an infection before it causes damage (disease). Vaccines are simply a way to expose the immune system to a foreign antigen that will then protect you from some dangerous infections. Vaccines contain either small particles of the germs or toxins, which are obviously physically incapable of causing the disease, but enough to generate an immune memory (such as the tetanus and whooping cough vaccines), or the whole germ that has been inactivated in such a way that it will still be recognised as that germ, but is no longer in any way virulent and so cannot cause the disease (these are known as live attenuated vaccines and include the measles and chicken pox vaccines). Giving a vaccine activates the immune system, it shows the adaptive system what the antigen looks like, and is enough to generate memory cells against that antigen. This means that if exposed to the germ for real the body will recognise it, and can activate a quick and strong secondary response and neutralise the threat before it can cause any harm (before it can cause disease). The foreign antigens and other ingredients given in a vaccine are just enough to trigger the memory cells to be produced, but are easily eradicated and incapable of causing the disease. Each dose of a vaccine will lead to more memory cells, and therefore a quicker and greater response. Depending on the number of antigens in the vaccine, and the virulence of the germ that it is protecting you from, some need repeated doses to ensure that enough memory cells are generated to offer an adequate and long lasting protection, and the immunity conferred by some fade quicker than others and so need more regular boosters. After getting a vaccine the immune response (which is enough to trigger the development of memory cells) can make you feel transiently unwell, for example with a mild and shortlived fever. This is merely part of a healthy immune system response to a threat, and is NOT the infectious disease itself. Reducing underlying vulnerability to infection by improving sanitation and hygiene and socioeconomic status is also important to improve overall health and ability to fight off infection, but these measures are non-specific, and if the organism is virulent enough, even the healthiest of individuals can be seriously hurt or killed by infection. The clearest evidence of the effectiveness of vaccination is seen in the amazing achievement of being able to eradicate smallpox through worldwide vaccination programs, despite much of the population remaining in poverty without adequate diet, sanitation or living conditions. In addition, many of the diseases that we have vaccines for are capable of causing severe disease and death in even the healthiest person, and vaccinations are a safe way to specifically boost a persons own natural defences, and help protect people from some of the most virulent of organisms. Vaccines are not a force field, they are merely a way of boosting the persons own natural defences, and helping the battle between germ virulence and host defense be won by the defensive host (the person).